The Draft 2013-2016 Strategic Plan is posted for public comment in accordance with the previously established timeline. (The timeline can be found at www.icann.org/en/news/public-comment/stratplan2013-04jun12-en.htm.) This draft takes into consideration community feedback gathered through consultations and submitted public comments. A Strategic Planning session is scheduled for Toronto that will be organized to take comment on this document and also raise for discussion future strategy formulation as well as a model for ICANN planning and execution. With regard to those last two items, community feed back also indicated that ICANN should undertake a full-scale strategy development for the next planning cycle to cover 3 to 5 years and that there be clear linkage of strategy and execution. Develop a shared vision and define ICANN‘s mission, to be followed consistently. Consider environmental forces and new developments that will impact the multi-stakeholder model. 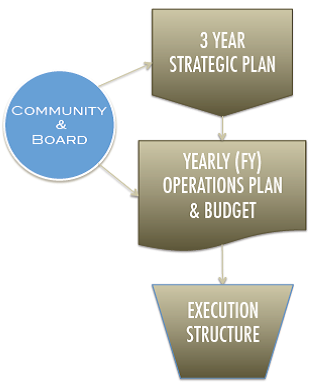 Formulate “macro-level” organizational objectives and goals that are clearly derived from ICANN‘s vision and mission. Facilitating understanding of organizational objectives and goals that form the basis of the annual Operating Plan and Budget. Measure effectiveness of initiatives and programs by implementing a management system of clear ownership, timelines, metrics and accountability. These are the critical elements that will ensure that ICANN‘s execution plan support the vision and mission articulated in the Strategy and that the execution plan is implemented with accountability and transparency.